This is the first official release by Romero and what a great release it is too. 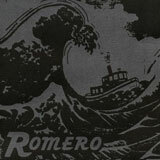 Cased in a screen printed black/silver cover depicting a boat coursing through a storm filled ocean at least partially prepares the listener for what is to come. Consisting of two anthemic tracks these boys from Wisconsin are responsible for kicking up the storm that’s causing the boat to flounder. Both ‘Solitaire’ on Side A and Side B’s El ‘Sentido Morboso’ channel a concentrated energy by counterpointing the introspection of quiet parts to full on riff laden, at volume verses which are further enhanced by the immediate whistle blowing choruses and close harmony vocals. Jeff Mundt neither a singer or guitarist in his previous bands Naked Aggression and Thug has transformed himself into the guitar hero phoenix rising from the ashes of his own burning drum kit. Citing influences such as Floor and Torche amongst others may indicate to the listener what the band are trying to achieve. What Romero deliver with this release is neither derivate or so far removed that it makes it difficult to relate their influences to what they play. Limited to 500 copies I would go and pick one of these 7″ pups up now before they become monstrously difficult to find.